Because of taking time off from work for the Thanksgiving and Christmas holidays at the end of November and December, I have not posted an end-of-the-month restaurant review since last October. 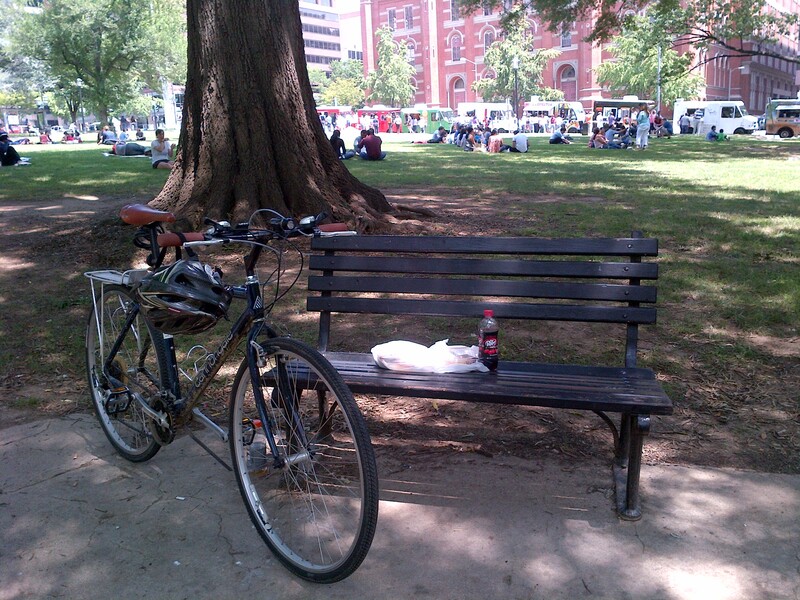 So this month I’m getting back into my routine with this post about one of my favorite lunch on-the-go spots – the Soho Café & Market, which is located across the Street from Franklin Square at 1301 K Street (MAP) in northwest D.C.’s Downtown neighborhood. Soho Café & Market is not a restaurant that focuses on one thing, like Horace and Dickie’s does with fish, or We, The Pizza does with pizza. Rather, Soho goes to the other extreme. They offer so many choices that it can sometimes make it difficult to make a decision of what to have. Soho offers a variety of grilled and deli sandwiches, gourmet pizza, an expansive fresh salad and fruit bar, fresh-rolled sushi served with complementary miso, and a Mongolian wok station, an espresso bar, and an insane selection of various desserts and beverages. Lastly, they also have my go-to favorite for lunch – several buffet-style hot food bars. Although there are a number of these types of places downtown, Soho has the widest selection I’ve seen. And because Soho is almost always quite busy, the food doesn’t look or taste like it’s been sitting out all day, which can be a big problem with some of the other places like this downtown. The only problem with the hot food bar is that everything looks so good that my eyes can tend to be bigger than my stomach. And since it is priced by weight, I have to remind myself to be careful when I am serving myself. Soho also opens at 6:00am for breakfast, for which they offer breakfast foods at the hot food bar, or omelets, breakfast sandwiches and other dishes cooked to order. There is also fresh fruit, yogurts, oatmeal, and a variety of doughnuts, pastries, biscuits and bagels as well. Soho is a solid choice for a quick lunch or breakfast downtown, but has limited “workday” hours, open only Monday through Friday for breakfast and lunch, and closed on evenings and weekends. But what it lacks in hours of operation it makes up for in always being impeccably clean, keeping enough cash registers open to ensure you can get in and out fairly quickly, and serving good food at a reasonable price. If I had to identify my biggest criticism of Soho, I would say that its biggest drawback is that there is very little ambiance, often making it seem more like a cafeteria than a restaurant. The inside has plenty of seating and is great for groups, but is merely functional at best. That is why I usually like to take my meal across the street to Franklin Square, where I can people watch while I enjoy what I’m eating. 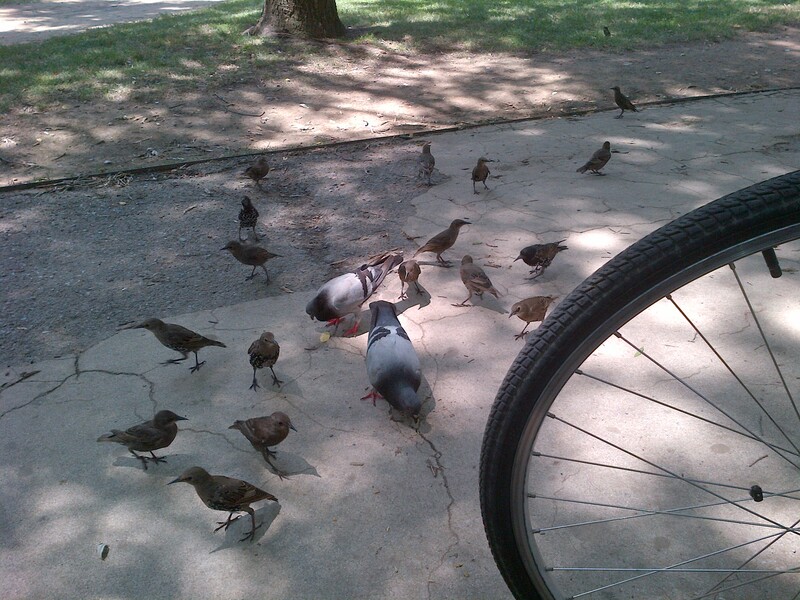 I even have company when I share some of it with the local pigeons. UPDATE: Sadly, as of September 1, 2017, Soho Café & Market closed. 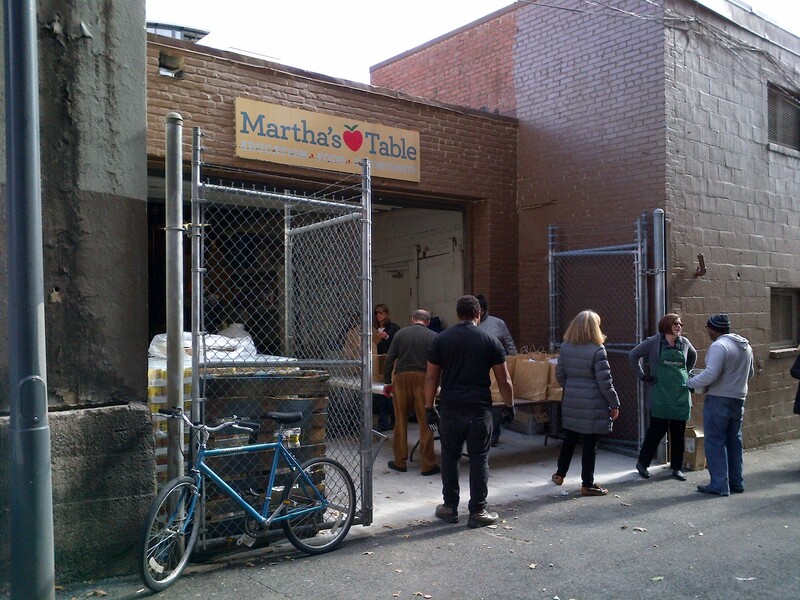 Two years ago today The Washington Post published a very interesting and uplifting article about Patty Stonesifer, former Chief Executive Officer of The Gates Foundation, who had agreed to lead a local food pantry here in D.C. named Martha’s Table. 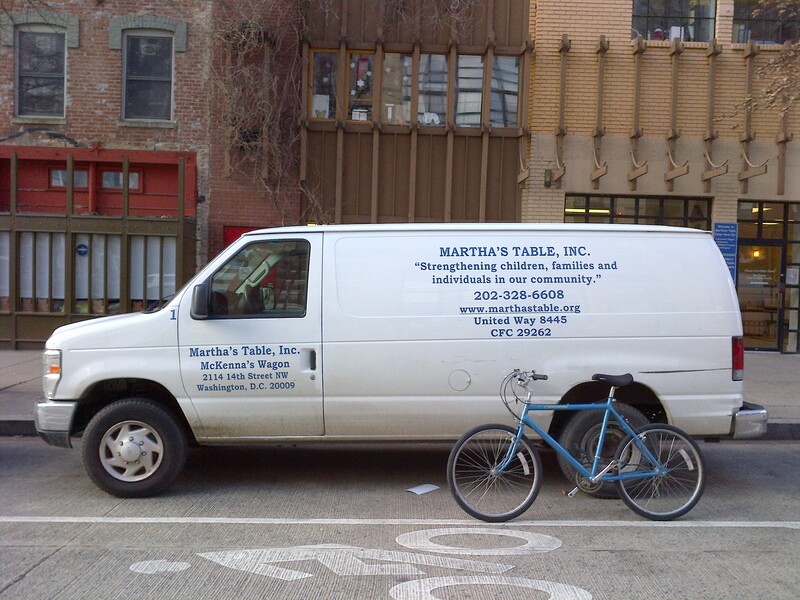 Patty, who had previously overseen The Bill and Melinda Gates Foundation’s endowment of $39 billion and a staff of more than 500 for nearly a decade, chose to manage Martha’s Table’s comparably small $6 million budget, 81 paid employees, three vans and a thrift shop. 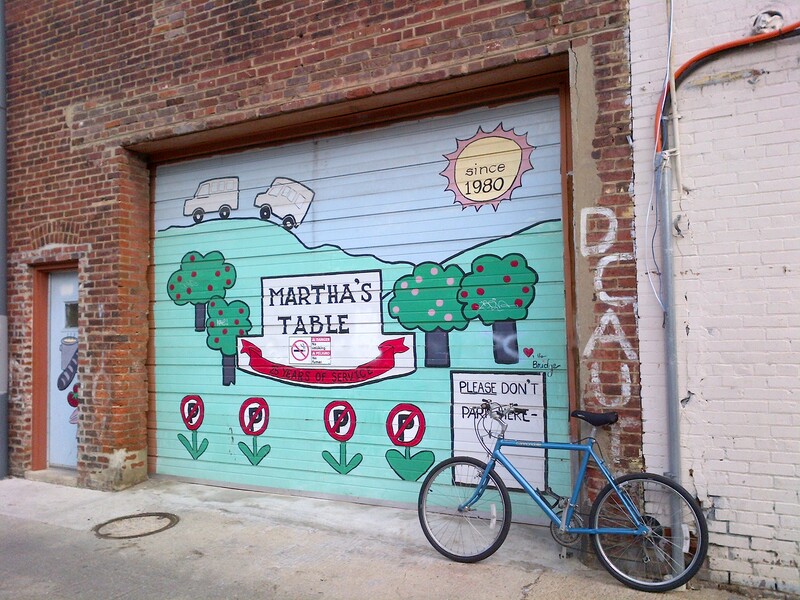 Martha’s Table is a well-regarded but decidedly local food pantry and family-services nonprofit organization. 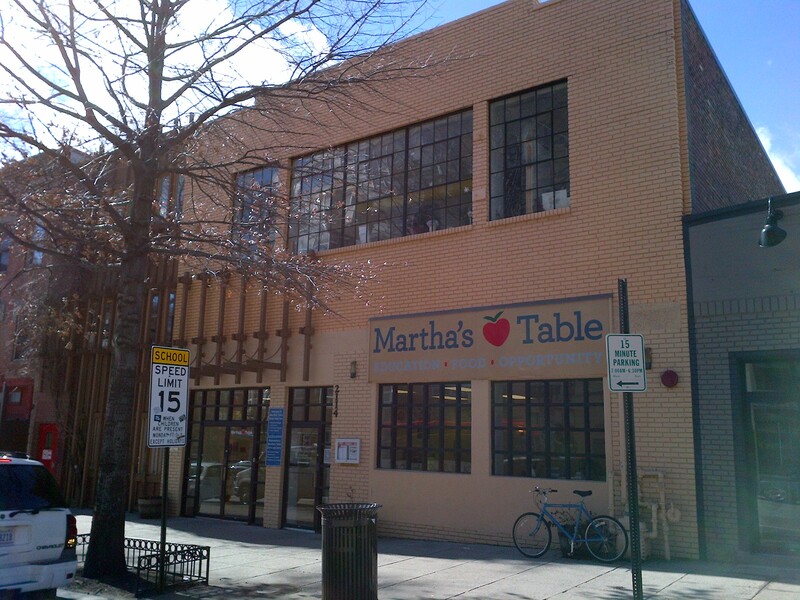 Beginning with humble roots in 1980, Martha’s Table was originally a place for children to receive free sandwiches and food after school. It gradually grew to address the additional needs of the community by finding solutions to poverty in the short and long term. They also address emergency needs with food and clothing programs and break the long cycle of poverty with education and family support services. The organization impacts over 1,100 people a day with its programs, including those for children and youths from ages 3 months to 22 years old, and their families. 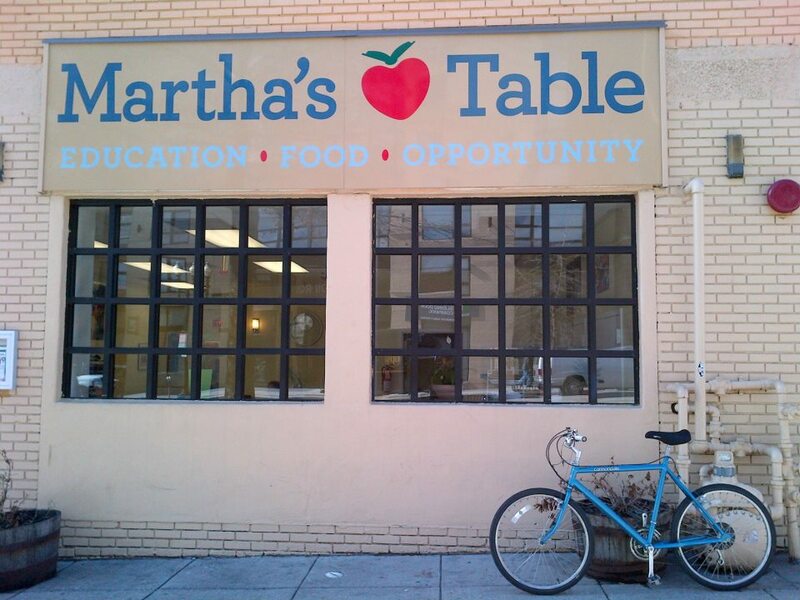 Anyway, after reading the newpaper article, I decided to ride to Martha’s Table to check it out on this lunchtime bike ride. 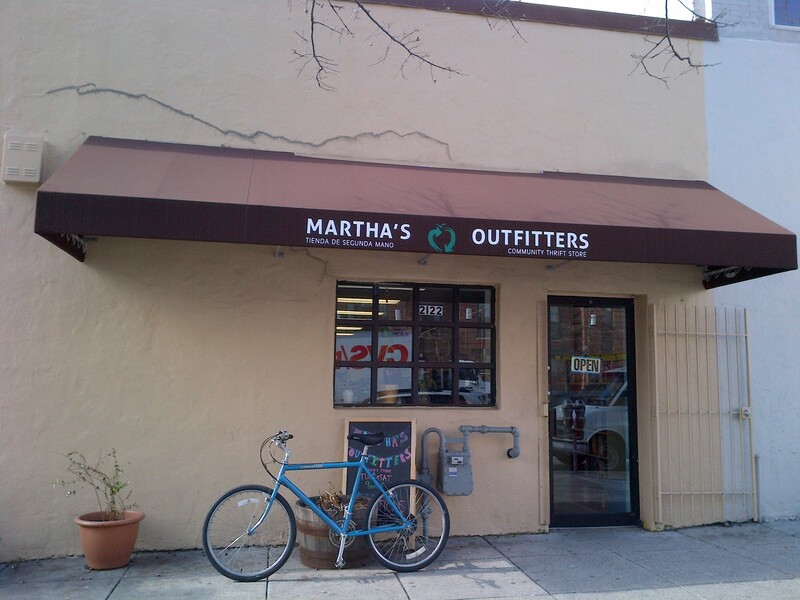 Their main office and their thrift store are located at 2114 14th Street (MAP) in northwest D.C.’s Shaw / Uptown neighborhood. It is not very far from my office, so after riding there I had a some extra time before I had to be back at my office and decided to wander around a little on my way back. As I was riding several blocks away I saw a commotion cause by a large number of people in a small alley. I paused to watch from a distance and, when it appeared to be benign, I rode down the alley to see what was going on. I could barely believe the coincidence when I found out that the commotion was the result of food distribution of the Emergency Food Program of Martha’s Table. As I later found out from their web site, the last Thursday of every month is Pantry Day at Martha’s Table, when they offer emergency food to anyone. The grocery bag give-away is held between noon and 1:00 pm only, and I just happened to be riding by when it was taking palce. As I stopped to watch what was going on, I noticed one of the volunteers because she looked oddly familiar. After watching for a little while it struck me that I recognized her from The Washington Post article. It was Patty Stonesifer. She was there, working on the front lines with the employee’s and volunteers, and handing out groceries to those in need. It was near their closing time as I was standing around in the alley watching the activity when Patty noticed me dressed in several layers of old sweatshirts and sweatpants to brace myself against the cold during my ride. I probably looked hungry too, since it was lunchtime and I hadn’t eaten yet. So she thought I was there for some food but was too apprehensive to ask. She came over to me and offered me a bag of groceries. I declined but thanked her, and then I was able to talk with her for a few minutes. I told her about my bike rides and how I had gone by their building on today’s ride because I had read about her in the newspaper. She’s a very interesting woman, who is now leading a very worthwhile organization. In addition to her previous position as the former chief executive of the largest philanthropic institution in the world, Patty has an impressive résumé. She was a senior vice president at Microsoft responsible for developing MSNBC, Encarta and Slate magazine. Patty was also asked by President Obama to chair the White House Council for Community Solutions, was the chairman of the Smithsonian Institution’s Board of Regents, and sits on the Board of Directors for Amazon.com. So with what would have been a lot of corner-office options to sift through, including a university presidency and the top jobs at a national charity and an international development agency, why did she chose a shift in scale comparable to the coach of an NFL football team deciding to coach high school football instead? 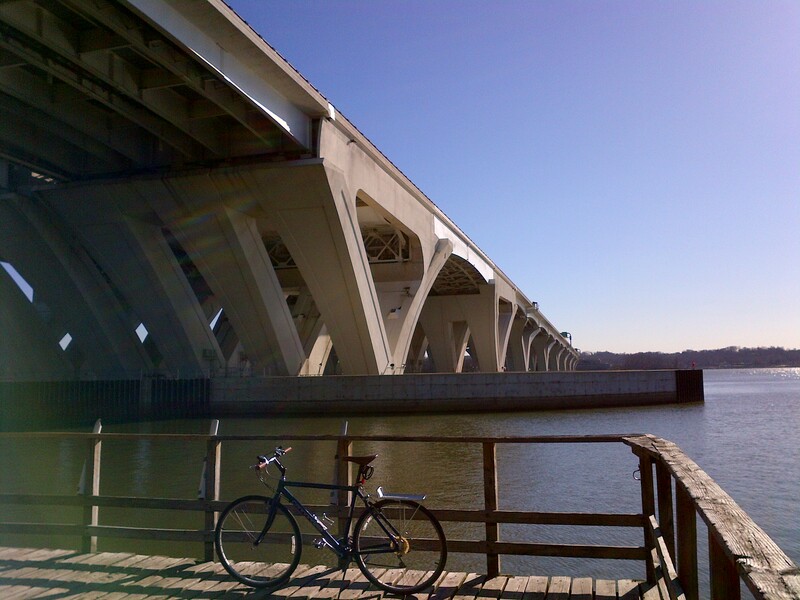 After moving to D.C., Patty began exploring the city by foot and Metro, much like I do by bike. During these explorations she was astounded by the level and extent of poverty and hunger, especially among children that she saw. So the answer is simple – she saw a need and decided to do something about it. I think that’s a lesson from which we can all learn. On this lunchtime bike ride I decided to go to Jones Point Park, which is located just south of Old Town Alexandria (MAP) in Virginia. The 65-acre park is operated by the National Park Service as land of the U.S. Department of Interior, and is located in an historic area on the banks of the Potomac River, on land which was a critical piece of the city of Alexandria’s early history as one of the largest centers for shipping, manufacturing, and transportation in the nation. 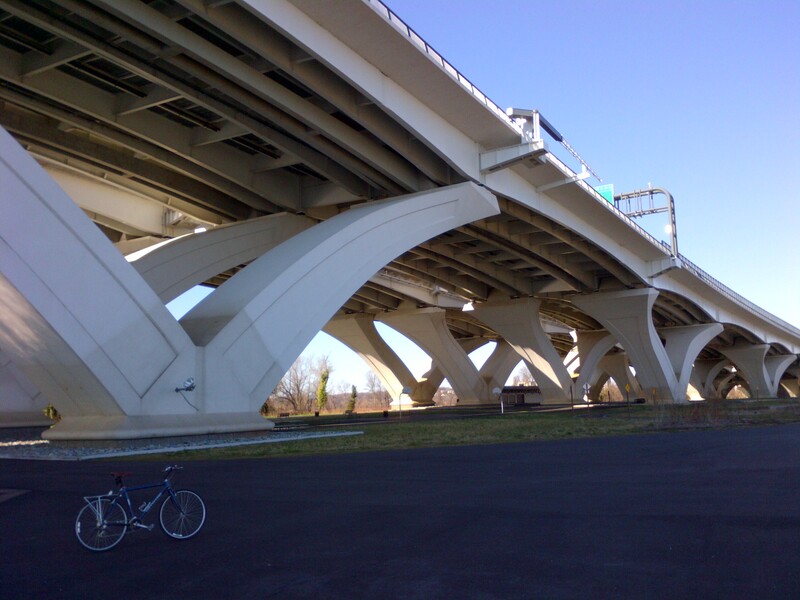 A large portion of the park also is located under the massive The Woodrow Wilson Memorial Bridge, which crosses the Potomac River and connects Virginia with Maryland. The park has formal spaces for recreation which include two playgrounds, one for children under age five and one for children ages six to ten. It has two basketball courts, restrooms, water fountains, picnic tables, multi-use recreational fields, as well as the historic Jones Point Lighthouse. Jones Point Park also includes a small boat launch that offers access to the Potomac River for canoes and kayaks, and two fishing piers, which all provide excellent opportunities to cast for American catfish, rock bass, and American eels. Fishing is permitted with the appropriate license. However, the boundaries for Virginia, Maryland and the District of Columbia all intersect at Jones Point. So depending on where you fish, the regulations for the different entities will apply. Federal fishing regulations also apply throughout the park. For anyone wanting to fish in this area, they should be aware of the health advisories on eating fish caught in this area of the Potomac River. The advisories may be found on state and municipal fisheries websites. Less formal areas of the park, including trails through an adjacent hardwood forest, are also available at the park by crossing the multi-use recreational fields. The 80-foot trees that make up the forest offer a haven for wildlife amid the local urban area, and are great habitat for viewing fall and spring birds that are drawn to these woodlands during migration in search of food and cover. And the trail down to the Potomac River offers spectacular views of waterbirds, wintering waterfowl and bald eagles. There is also an interpretive trail which provides information about the human and natural history behind Jones Point Park. Signs and exhibits along the trail highlight the area’s fresh water marsh habitat, its use by American Indians, and its role in shipbuilding and navigation. 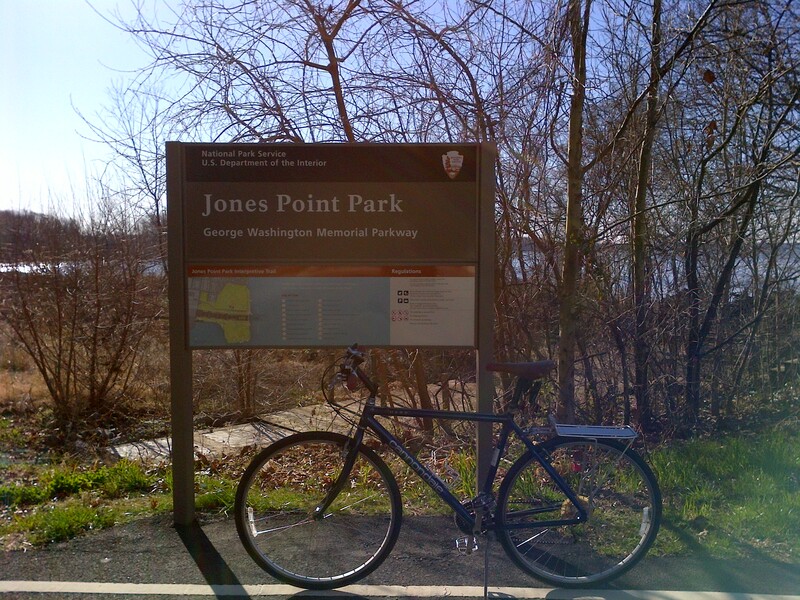 Jones Point Park is easily accessible by bike, because it is located along the Mount Vernon Trail, which actually runs through the park. So the next time you’re looking for a ride that’s a little bit longer, I highly recommend this park. 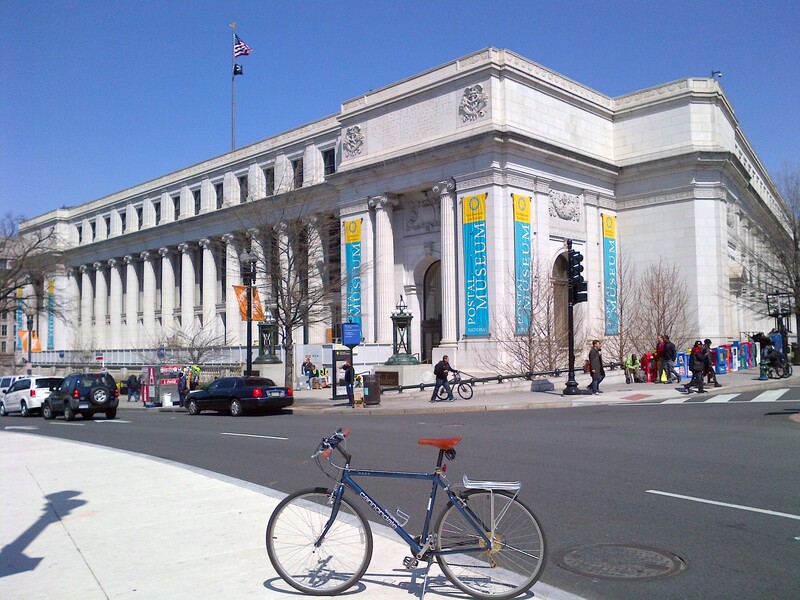 It’s not only a great destination, but there’s plenty to see along the way during the ride from D.C.
You don’t have to be a philatelist, more commonly known as a stamp collector, to appreciate today’s destination, but it helps. 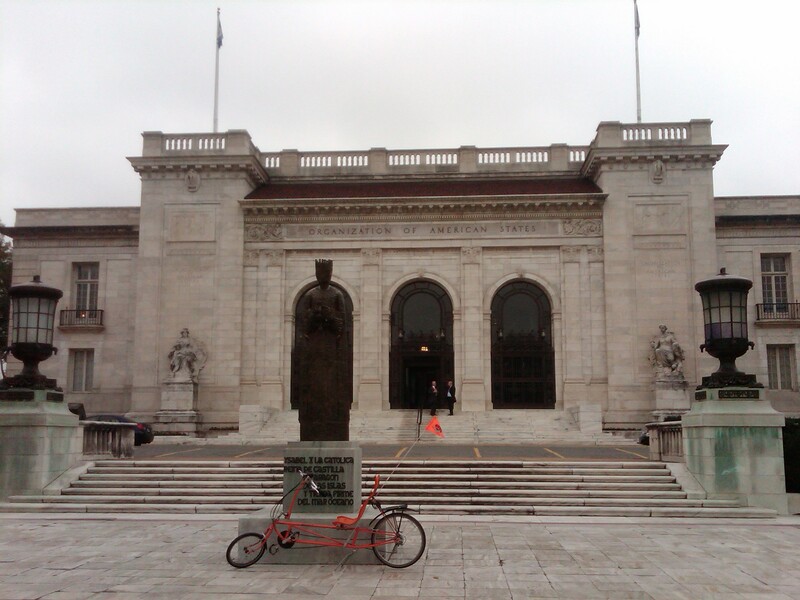 On today’s lunchtime bike ride I went to the National Postal Museum, located at 2 Massachusetts Avenue (MAP) in northeast D.C.’s NoMa neighborhood. 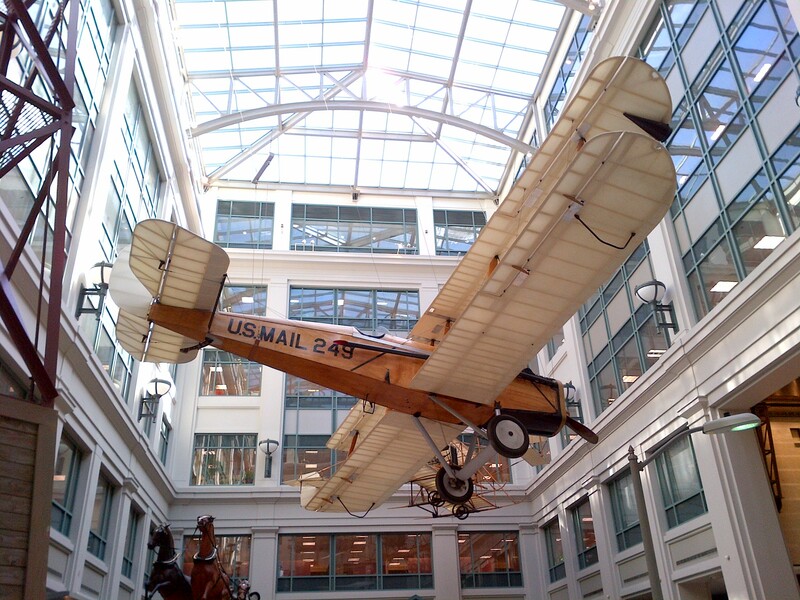 The museum is across the street from Union Station, in the historic City Post Office Building that once served as the main Post Office of D.C. from 1914, when it was constructed, until 1986. 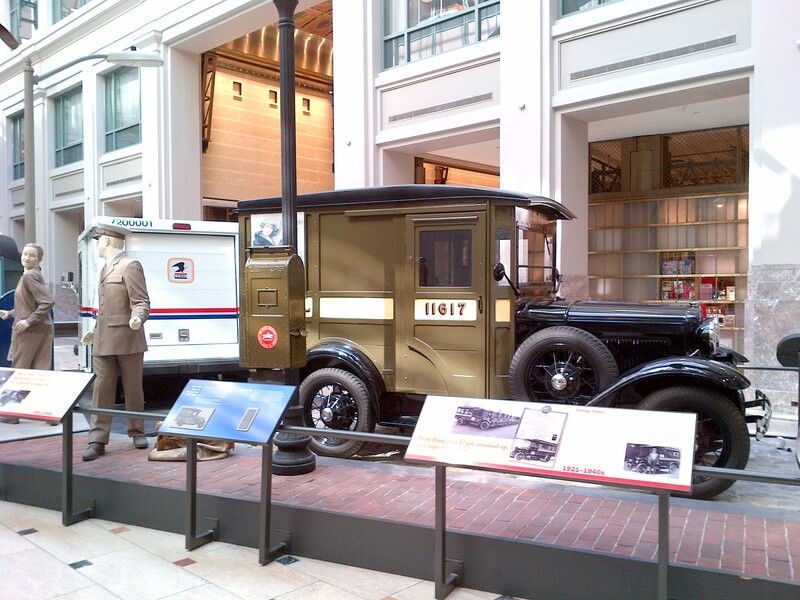 The National Postal Museum was established through a joint agreement between the United States Postal Service and the Smithsonian Institution, and opened in July of 1993. 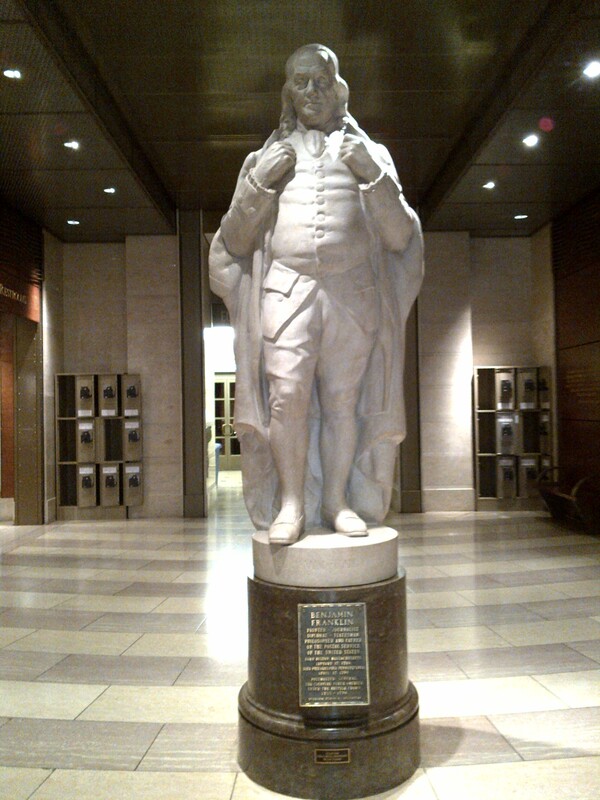 As you might expect, the museum houses on of the largest stamp collections in the world. 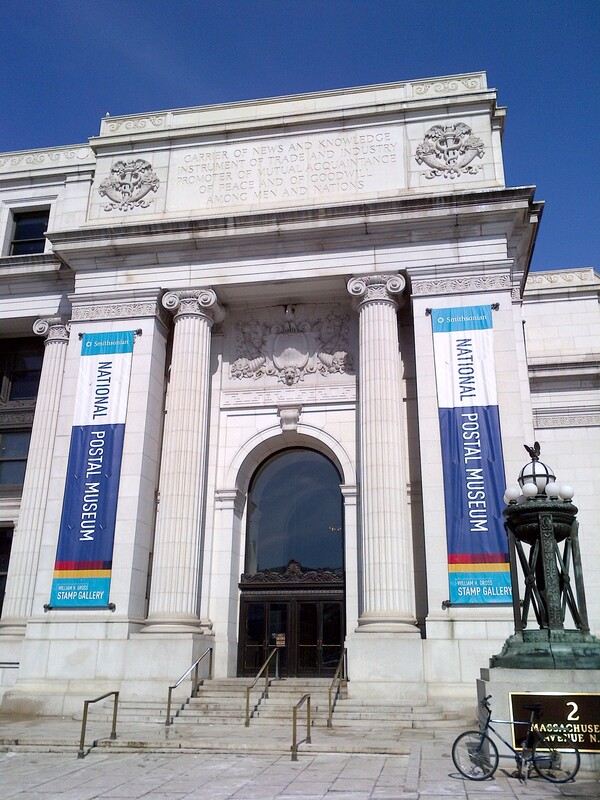 Known as the National Philatelic Collection, it was originally established at the Smithsonian Institution in 1886 with the donation of a sheet of 10-cent Confederate postage stamps. Generous gifts from individuals and foreign governments, transfers from government agencies and occasional purchases have increased the collection to today’s total of more than 5.9 million items. In addition its vast collection of stamps, the museum also houses many exhibits and interactive displays about the history of the U.S. Postal Service as well as mail service around the world, including postal history materials that pre-date stamps. 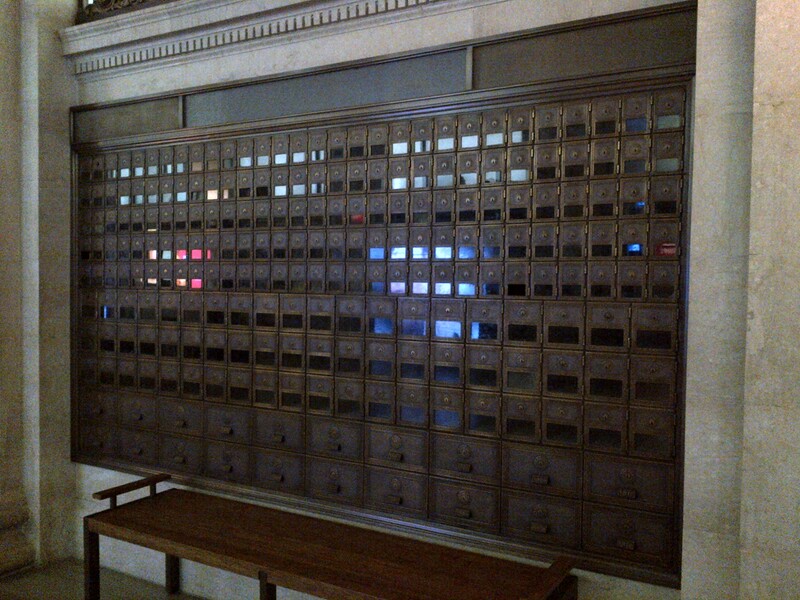 Among other various items from the history of the postal system, it also has on display vehicles such as stagecoaches and airplanes which were used to transport the mail, as well as mailboxes and mailbags, postal uniforms and equipment, exhibits on the Pony Express, the use of railroads with the mail, and the preserved remains of a dog named Owney, the unofficial Postal Service mascot. The museum also houses a gift shop and a separate stamp shop where visitors can purchase stamps and other collectibles. 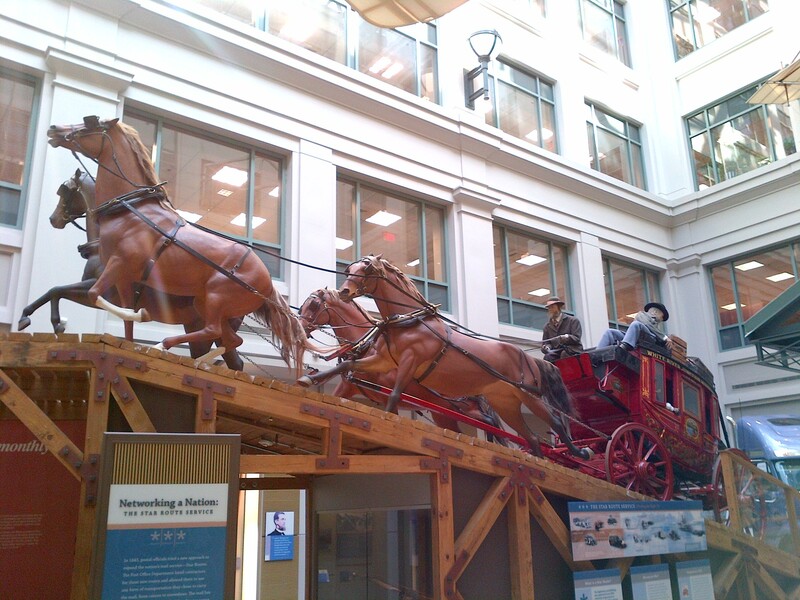 The National Postal Museum receives funding through three primary sources: the U.S. Postal Service, the Smithsonian Institution’s annual Federal appropriation, and gifts from private individuals, foundations, and corporations. So for visitors, admission is free. Public art is fairly commonplace in many parts of D.C., and as I have been able to see during my bike rides, it has become even more prevalent over the past few years. One of the contributors to this increase is muralist Garin Baker, who has a number of pieces of public art throughout the city. On this ride my destination was one of his murals, one entitled “This is How We Live.” It is located adjacent to a playground, on the side of a building at 239 Elm Street (MAP), near the corner at 3rd street in northwest D.C. And it is not only located in the LeDroit Park neighborhood, it captures the neighborhood as the subject of the mural. Mr. Baker currently runs a small public art company called Carriage House Arts Studios, which is responsible for countless public and private large scale mural projects across the country, including in New York and Atlanta, as well as D.C. 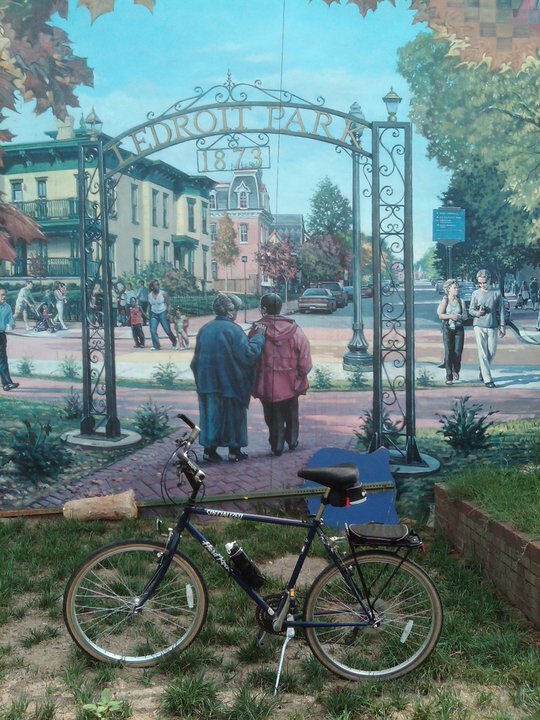 In fact, Mr. Baker recently completed two murals located at the Turkey Thicket Recreation Center in northeast D.C.’s Brookland neighborhood, which I hope to ride to and see one day soon. 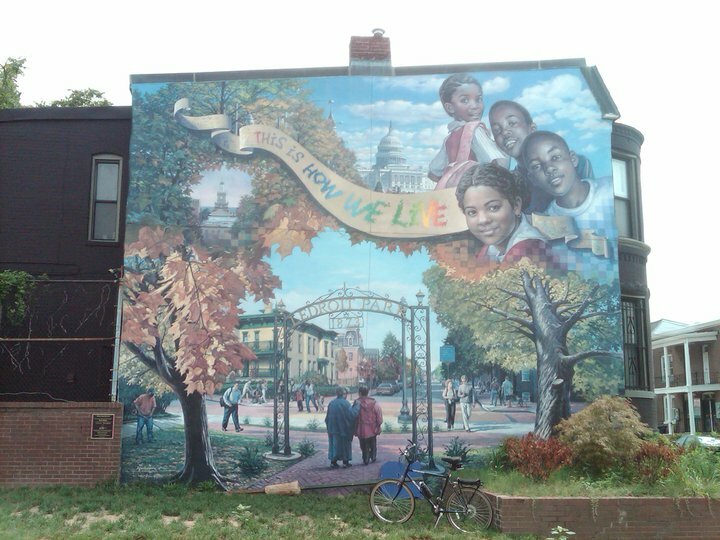 The D.C. Commission on the Arts and Humanities, in collaboration with residents from the LeDroit Park community, commissioned Mr. Baker to design, create and install ”This is How We Live,” a photo-realistic mural, which was done in the tradition of the depression-era muralists hired by the Works Progress Administration as part of the President Franklin D. Roosevelt’s New Deal Plan, which employed millions of mostly unskilled, unemployed people to carry out public works projects, including the construction of public buildings and roads. 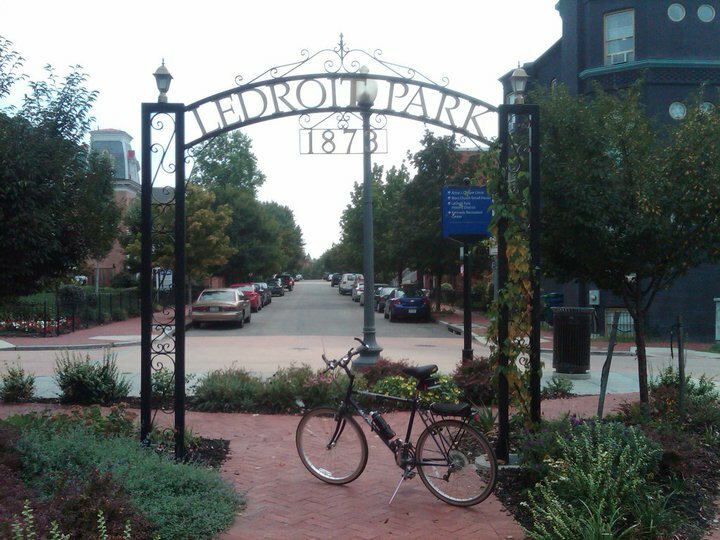 As one of the city’s first suburbs, LeDroit Park was developed and marketed as a “romantic” neighborhood, with numerous flowerbeds and extensive landscaping to include narrow tree-lined streets. The developers even named the streets after the trees that shaded them, differing from the street names used in the rest of the city. Originally a whites-only neighborhood, it was through the efforts by many, especially actions by students from neighboring Howard University, which led to the integration of the area. By the 1940s LeDroit Park became a major focal point for the African-American elite, with many prominent figures residing there. Today, LeDroit Park residents represent a wide variety of ethnic groups, and it’s that diversity that entices new residents to the community. 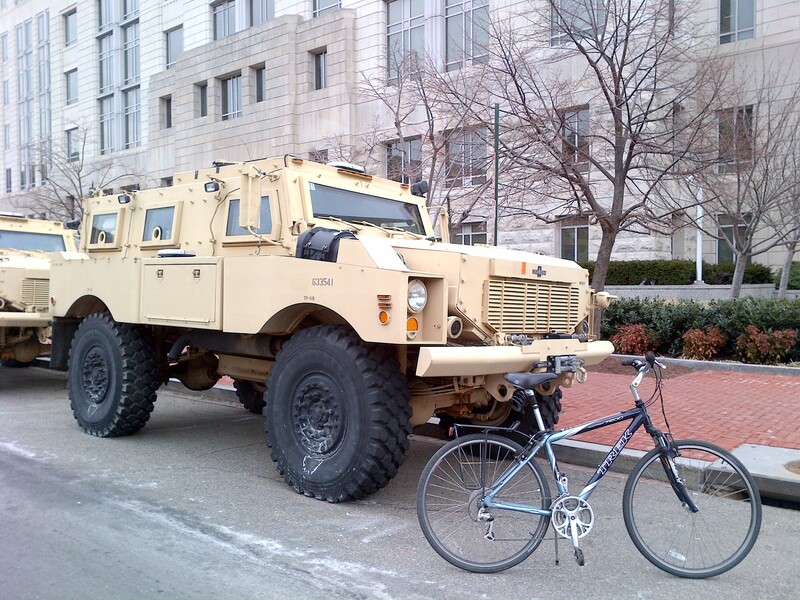 Armored Assault Vehicles on the Streets of D.C. When riding a bike around the city, you just never know what you’re going to encounter. This is particularly true when it comes to the variety of vehicles which can be found parked on the streets. 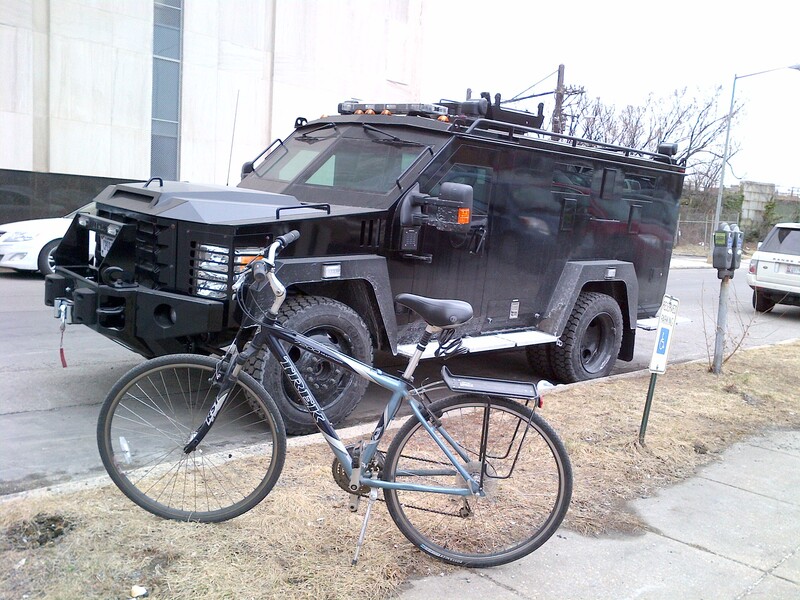 A couple of examples of this are these armored personnel carriers/assault vehicles, which I saw on one of my recent lunchtime rides. Happening upon these vehicles caused me to think about a couple of political issues that have been in the news as of late. The first issue pertains to the Department of Defense Excess Property Program (also known as the 1033 Program), which is authorized under Federal law and managed through the Defense Logistics Agency’s Law Enforcement Support Office in Fort Belvoir, Virginia. The program is intended to provide surplus military equipment to state and local civilian law enforcement agencies for use in counter-narcotics and counter-terrorism operations, and to enhance officer safety. The program has recently been in the news in the wake of a grand jury’s exoneration of the police officer involved in the shooting of Michael Brown in Ferguson, Missouri, when police officers wore combat gear and used armored vehicles and military-style equipment to respond to the protesters and rioters. The attention this garnered prompted The White House to undertake a study of the program, during which it was revealed that the Department of Justice, the Department of Homeland Security, the Treasury Department, and the Office of National Drug Control are also involved in providing small arms, vehicles, logistical support, and monetary grants to police departments around the country. The issue currently remains ongoing and in the public eye. Another issue currently in the news is what is considered by many to be the alarming rate at which the Federal government is arming and equipping Federal agencies. An example of this is the recent news stories about how the Department of Homeland Security is contracting to purchase up to 1.6 billion rounds of hollow-point ammunition, along with 7,000 fully-automatic weapons including 30-round high-capacity magazines. To put that amount of ammunition into perspective, at the height of the Iraq War the Army was using less than 6 million rounds a month. Still more examples include: the Department of Agriculture recently contracting to purchase sub-machine guns and body armor; the purchase of 174,000 rounds of hollow-point pistol ammunition by the Social Security Administration; the National Oceanic and Atmospheric Administration’s purchase of 46,000 rounds of .40-caliber hollow-point ammunition, and; the Department of Education’s purchase of a number of 12-gauge shotguns that are compatible with combat training. Further, many think that the way in which Federal agencies have been arming and equipping themselves has been leading to confrontations between citizens and the government. One prominent example of this is the recent armed standoff in Nevada between cattle rancher Cliven Bundy and a group of protesters and militia members, and agents of the United States Bureau of Land Management. There is no information to indicate that either of these two armored vehicles, thought to be owned by different Federal agencies, have been involved in any incidents in the news, or used in ways other than intended. However, the agencies which own and control these vehicles may want to reconsider parking them on public streets, if only for appearances sake. And in any case, don’t park in a space reserved for the disabled, as the black vehicle was when I saw it. Occasionally the destination for my daily lunchtime bike ride is an event rather than a location. 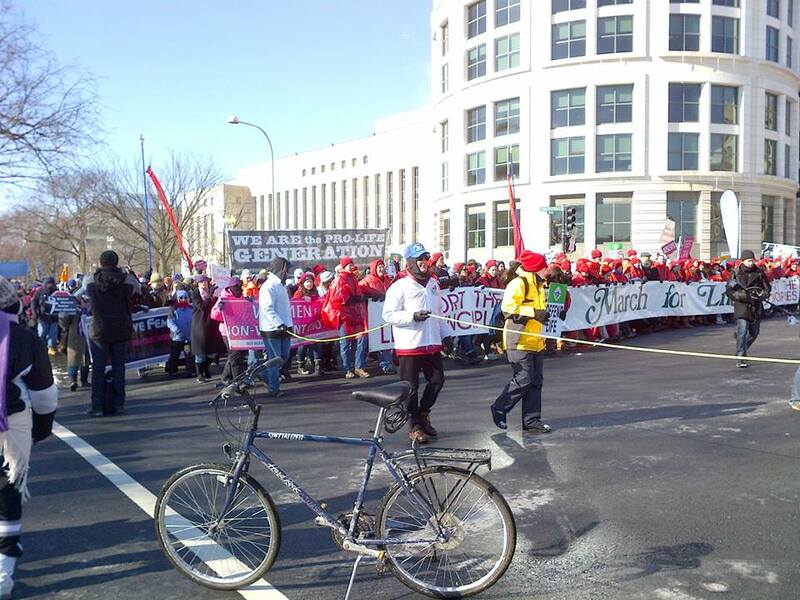 That was the case for this ride, as it is every January 22nd, when the “March for Life” takes place in D.C. The March for Life is an annual event which began as a small demonstration on the first anniversary of U.S. Supreme Court decisions in the cases known as Roe v Wade and Doe v Bolton, which were landmark decisions on the issue of abortion. 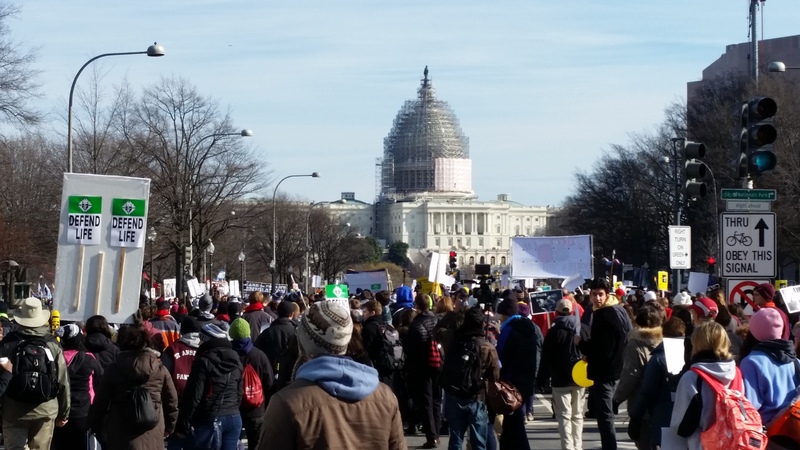 Over the years the March for Life has grown to include numerous other cities in the United States and throughout the world. 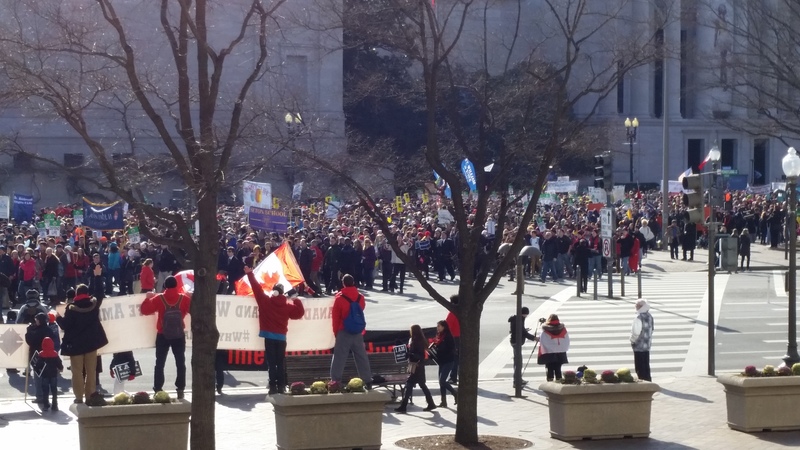 The March in D.C., however, has become and remains the largest pro-life event in the world. The first March for Life was founded by Nellie Gray, a lawyer and employee of the Federal government for 28 years, who after the Supreme Court decisions chose to retired and become a pro-life activist. The event was held on January 22, 1974, on the West Steps of the U.S. Capitol Building, with an estimated 20,000 supporters in attendance. Over the years, the attendance has increased substantially, with recent estimates of well in excess of a half a million participants. And it is estimated that about half of the marchers are under age 30, with many teenagers and college students attending the march each year, typically traveling with church and other youth groups. The day’s events usually begin at noon with a rally on the National Mall, which features prominent activists, celebrities, and politicians. In some past years it has even including addresses by U.S. Presidents, including Ronald Reagan and George W. Bush. President Barack Obama has been invited, but chose instead to decline and issue a pro-abortion written statement. 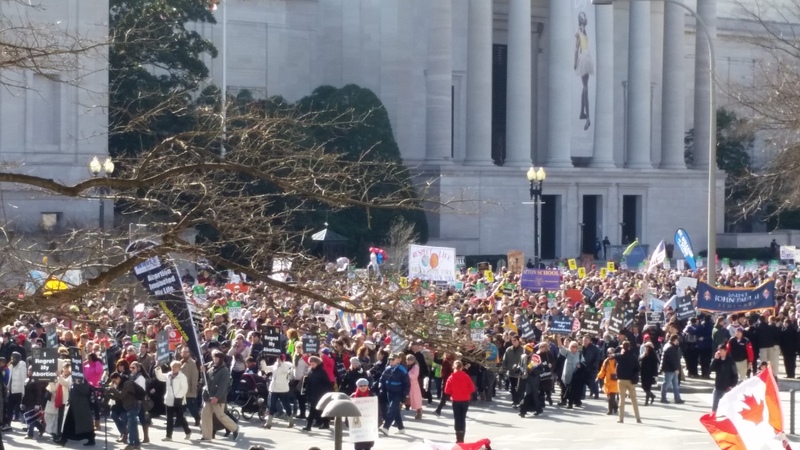 The rally is followed by the march, which begins near Fourth Street and travels down Constitution Avenue, turns right at First Street and proceeds past the U.S. Capitol Building, before ending on the steps of the U.S. Supreme Court Building. Another rally is then held in front of the Supreme Court Building, which features accounts from women who regret their abortion, referred to as “Silent No More” testimonies. Many other associated events also take place in D.C. each year during the week in which the March is held. Various pro-life organizations hold events such as a candlelight vigil at the Supreme Court building, church and prayer services, educational conferences, and visits to lobby Congressional representatives. A dinner is also held each year, hosted by The March for Life Education and Defense Fund, which is the primary organizer for the March. 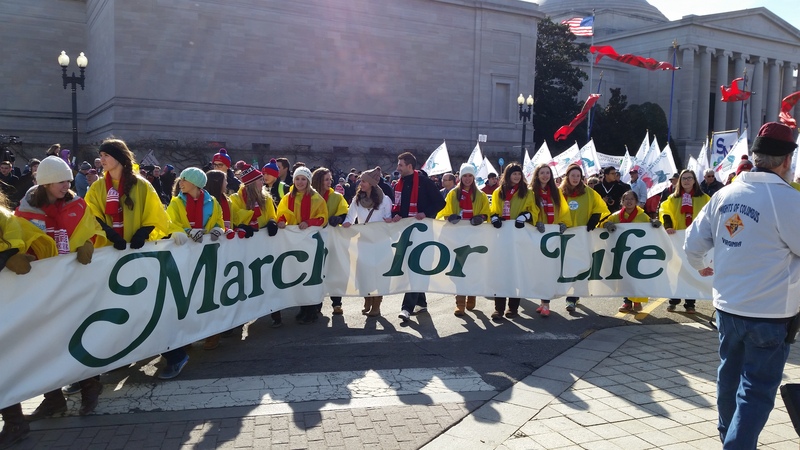 An organization named Students for Life of America, which is the largest association of pro-life groups or clubs on college campuses, also holds an annual conference in D.C. for pro-life youth on the week of the march. 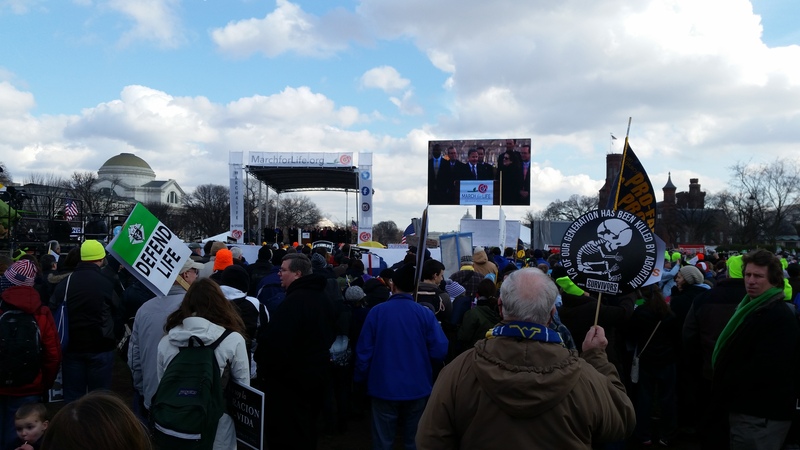 In recent years, the March for Life has chosen to focus on a theme in order to bring attention to specific aspects of the issue. Coinciding with this year’s 25th anniversary of the Americans with Disabilities Act, the March for Life 2015 theme is “Every Life is a Gift,” with a special focus on babies who are diagnosed in the womb with a disability or fetal abnormality. Statistics indicate that this population is at the greatest risk for abortion, with studies indicating that approximately 85% of these pregnancies are ended by abortion, compared with the national abortion average of approximately 20%. During this week that began with the Martin Luther King, Jr. Federal holiday, I also found it noteworthy that his niece, Dr. Alveda King, was a prominent participant in the March for Life. Dr. Alveda King is a civil rights advocate, NAACP member, author, and Christian minister. In her capacity as a full-time Pastoral Associate of African-American Outreach for the Roman Catholic group, Priests for Life, she is also a staunch and outspoken pro-life advocate. 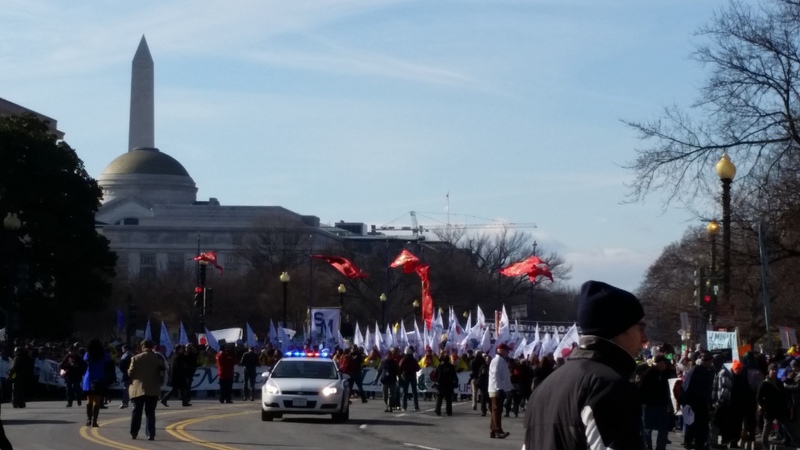 March for Life has received relatively little attention from the press or mainstream media over the years. So to counter the relative lack of coverage, one of the March for Life’s supporters, The Family Research Council, organized what it called a Blogs for Life conference several years ago, which took place in D.C. and was one of the March for Life week’s events in 2011. The main goal of the conference was to “bring pro-life bloggers together to discuss strategies for securing more effective media coverage and advancing anti-abortion issues. Such strategies include securing media coverage through legislative means or by tapping into the new media outlets of the future, such as blogging. On this lunchtime bike ride I rode to the headquarters for the Organization of American States (OAS), known as the Pan American Union Building, which is just off of Pennsylvania Avenue and across the street from The Ellipse, at 200 17th Street (MAP) in northwest D.C.’s Foggy Bottom neighborhood. Unofficially, however, the reasons for its formation were somewhat different than the charter’s stated intent. The Latin American member states wanted a political institution to deal with intra-hemispheric disputes based on their fears that the United States, intent on its anticommunist crusade at that time, might engage in unilateral interventions against Latin American governments. For the United States, it was intended to serve as a protection against communist penetration of the Western Hemisphere. The OAS has had some successes, including settling border conflicts between various member countries, such as the truce and subsequent resolution of the Soccer War between Honduras and El Salvador in 1969. However, in generally it never actually functioned as any of the member states had intended, and neither side got what it had hoped for when it was formed. The OAS proved a disappointment to the United States because the other member states did not share its own Cold War zeal against communism. This was evidenced by the organization’s refusal to approve direct action to remove what the United States felt were “communist threats,” most notably in Fidel Castro’s Cuba. For the other member states, disappointment in the OAS centered around the organization’s failure to curb the United States use of unilateral force in other situations, such as the U.S.-orchestrated overthrow of the government of Guatemala in 1954, the failed Bay of Pigs invasion of Cuba in 1961, and its intervention in the Dominican Republic in 1965. The OAS has grown over the years to a total of 35 countries, and now includes Canada and 14 additional independent countries in the Caribbean. However, since the end of the Cold War, the OAS’s importance in intra-hemispheric affairs has continued to diminish. The OAS’s original charter members, listed in alphabetical order, were Argentina, Bolivia, Brazil, Chile, Colombia, Costa Rica, Cuba, the Dominican Republic, Ecuador, El Salvador, Guatemala, Haiti, Honduras, Mexico, Nicaragua, Panama, Paraguay, Peru, the United States, Uruguay, and Venezuela. Countries that were subsequently admitted, in chronological order of when they became a member, are Barbados, Trinidad and Tobago, Jamaica, Grenada, Suriname, Dominica, Saint Lucia, Antigua and Barbuda, Saint Vincent and the Grenadines, Bahamas, Saint Kitts and Nevis, Canada, Belize, and most recently, Guyana, which was admitted in 1991. After getting temporarily lost on a recent bike ride, I got out a map when I got back to my office to see where I had been. 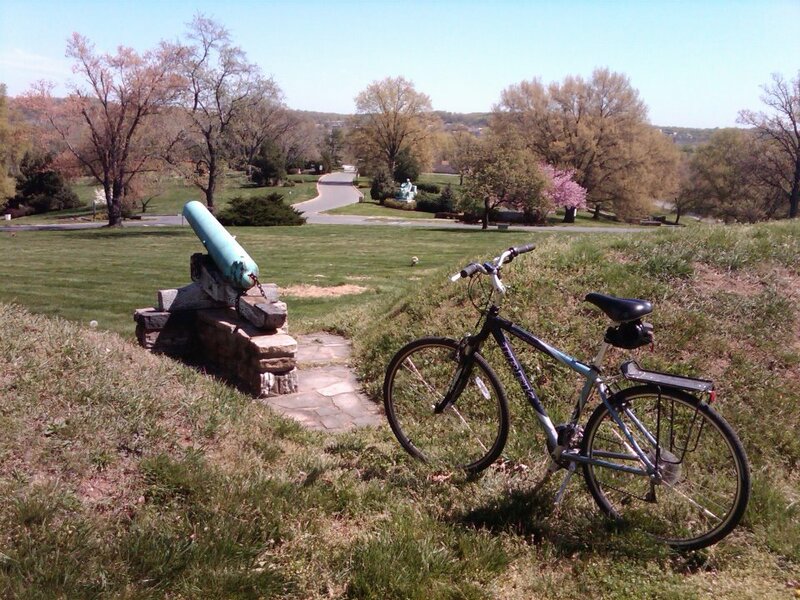 It turned out that the area where I had been riding, which is just north of The National Arboretum, has as many, if not a greater number of historical sites than practically any other location I’ve seen of comparable size. While looking at the map I also noticed that I had been very near historic Fort Lincoln, so on this ride I went back to explore. There was too much too see in one trip, however, so I’ll have to plan to go back again. Fort Lincoln was a Civil War-era fort constructed by the Union Army in 1861 for use in the defense of the national capital city. The remnants of the fort are just past the D.C. city limits in Prince George’s County, Maryland, and is located at 3401 Bladensburg Road (MAP) in Brentwood, Maryland. 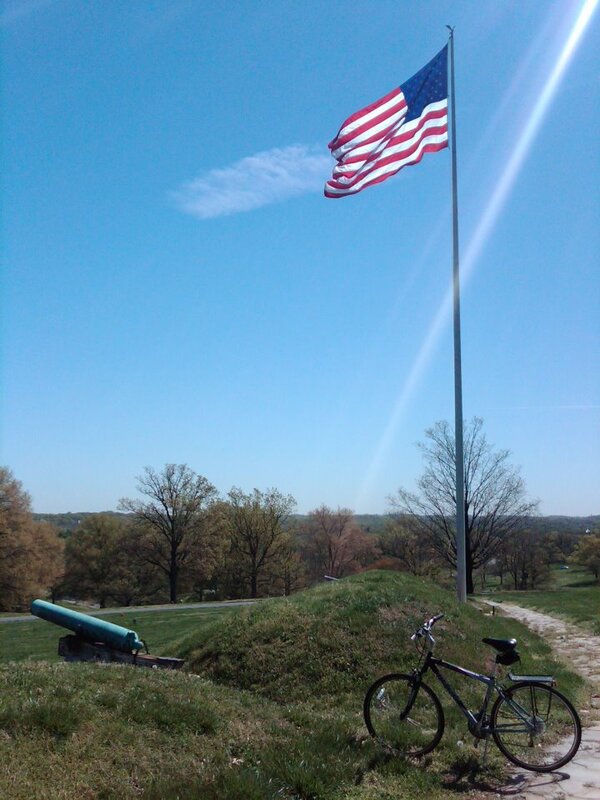 The fort is located within the boundaries of Fort Lincoln Cemetery, near the Old Spring House and adjacent to the infamous Bladensburg Dueling Grounds. The area surrounding D.C. had 68 major enclosed forts, as well as 93 prepared, although unarmed, batteries for field guns, and seven blockhouses surrounding it during the Civil War. This system of forts is known collectively as the Civil War Defenses of Washington, or the Fort Circle Parks. Fort Lincoln was part of this system of forts. Much of what remains of the system of forts is now a collection of National Park Service properties, while other forts have become state and city parks in the area. Forts Foote, Greble, Stanton, Ricketts, Davis, Dupont, Chaplin, Mahan, and Battery Carroll are administered by National Capital Parks-East. Forts Bunker Hill, Totten, Slocum, Stevens, DeRussy, Reno, Bayard, Battery Kemble, and Battleground National Cemetery are administered by Rock Creek Park. And Fort Marcy is administered by George Washington Memorial Parkway. There is also a trail connecting four of the parks, the Fort Circle Park National Recreation Trail, which is also operated and maintained by the National Park Service. 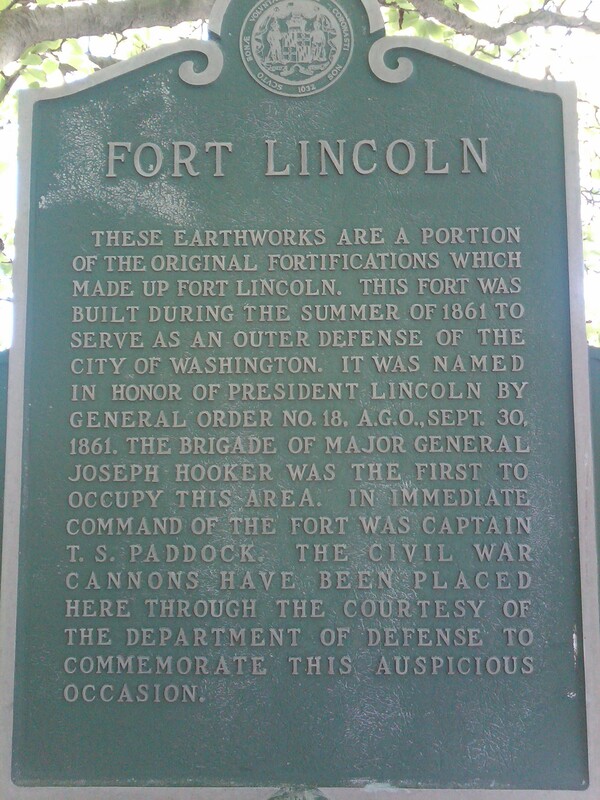 I look forward to going back to the area near Fort Lincoln to explore more of the history there, as well as eventually visiting all of the other remaining Fort Circle Parks. 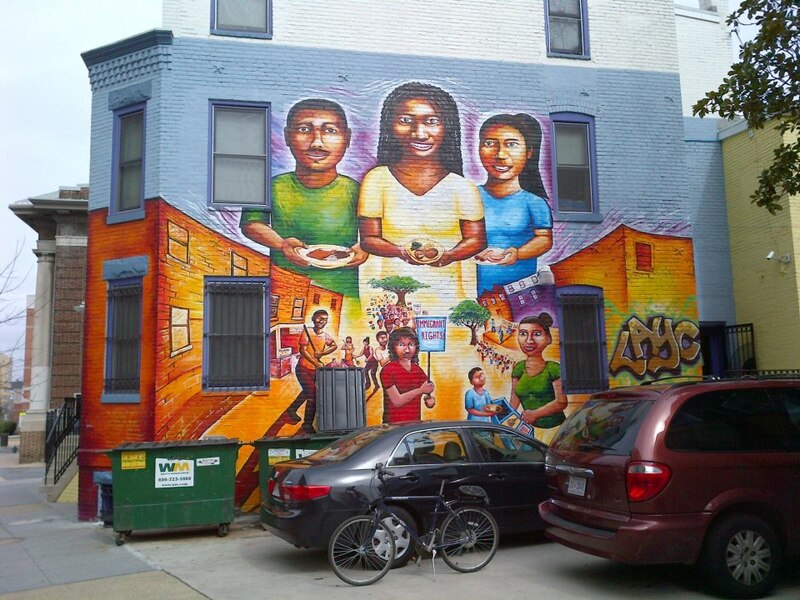 While on this bike ride in northwest D.C.’s Columbia Heights neighborhood, I discovered a mural entitled “My Culture, Mi Gente.” But as I later discovered when I was trying to find out more about what I had seen, it is more than just a mural. And the man who created it is more than just an artist. 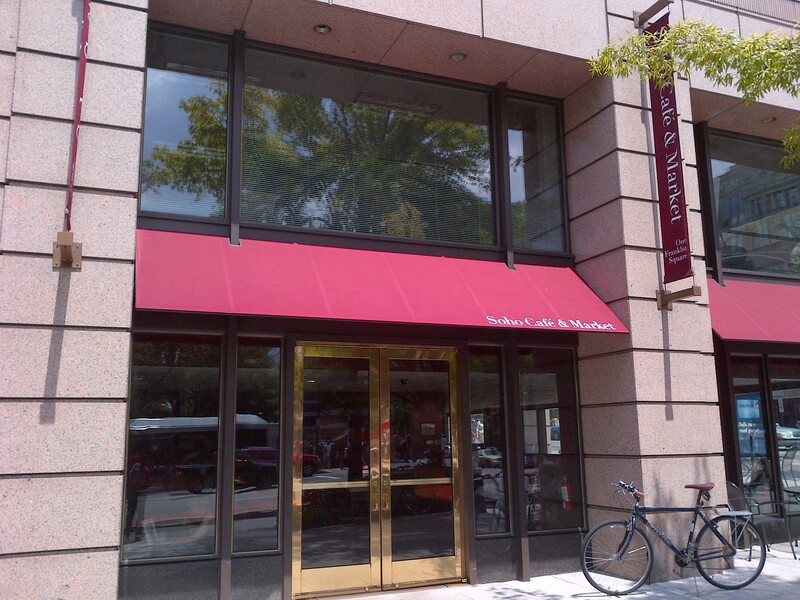 “My Culture, Mi Gente” is located at 3064 15th Street (MAP), across the street from the Columbia Heights Metro Station, in northwest D.C. 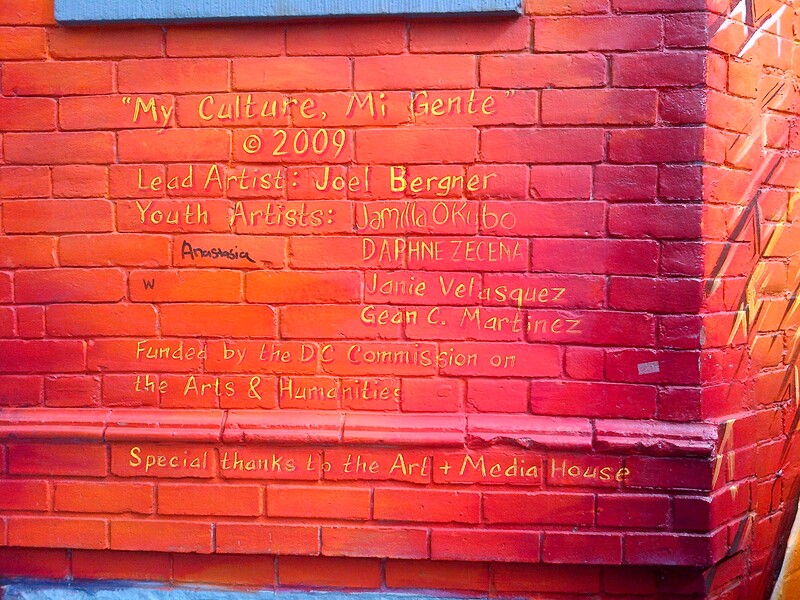 Funded by the D.C. Commission on the Arts and Humanities, the colorful mural celebrates the neighborhood’s rich diversity and culture, and was created by artists from the Latin American Youth Center’s Art+Media House, including Jamilla Okubo, Daphne Zecena, Janie Velasquez, and Gean C. Martinez, along with lead artist Joel Bergner. Also known as Joel Artista, Joel Bergner is a social action muralist and street artist, as well as a youth and community art organizer who through art projects seeks to educate others on issues of culture and social justice by creating works that relate stories of those who have been ignored or misunderstood by society. In addition to “My Culture, Mi Gente,” Joel Berger has also created large public murals in many other U.S. cities, as well in Brazil, the Zaatari refugee camp in Jordan, Cuba, Kenya, Mozambique, Poland, Cape Verde in West Africa, El Salvador, and Peru. And much like his collaboration with the Latin American Youth Center here in D.C., his other works often feature collaborations with other youth-based organizations which represent incarcerated teenagers, Syrian refugees, youth from marginalized communities, the mentally and physically disabled, and street children in Rio de Janeiro. He has been commissioned by and worked with human rights groups as well, including the International Rescue Committee, the U.S. Committee for Refugees and Immigrants, the Boys & Girls Club, UNICEF and Amnesty International. I also found out that he has created other murals and other public art works here in D.C. So I hope to visit them on some of my future bike rides, and continue to learn more about the social awareness and action which they inspire.